The Christian ethics inevitably, through the emphasis laid upon sexual virtue, did a great deal to degrade the position of women. Since the moralists were men, woman appeared as the temptress ; if they had been women, man would have had this ro1e. Since woman was the temptress, it was desirable to curtail her opportunities for leading men into temptation ; consequently respectable women were more hedged about with restrictions, while the women who were not respectable, being regarded as sinful, were treated with the utmost contumely. It is only in quite modern times that women have regained the degree of freedom which they enjoyed in the Roman Empire. The patriarchal system, as we saw, did much to enslave women, but a great deal of this was undone just before the rise of Christianity. 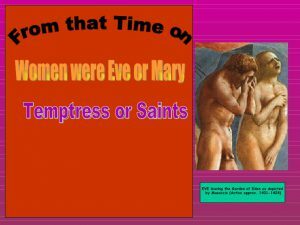 After Constantine, women’s freedom was again curtailed under the pretence of protecting them from sin. It is only with the decay of the notion of sin in modern times that women have begun to regain their freedom.